This Canon Diary entry is a speedy run-through of the Canon chord sequence and is intended as a quick chord work-out to sharpen up your chord sense. CD 12-05-12 also develops a syncopated bass part with step-by-step video coaching. Here is the teaching video for Canon Diaries 12-05-12. Here is the reference video for the syncopated performance demonstrated above. Work through the module before expecting to play this! In performance, the right hand chord tones are broken up with the second chord of each pair anticipated, and the bass following the syncopation. Because the second chord in each pair is pulled forward (anticipated), the third 'T' in the bar is the top note of the second chord in the pair (A, F#m etc.) Play the third at the top the first time (see the music). Here is a MidiPiano performance video of the Canon Diary 12-05-12 entry, with the actual performance on the upper keyboard and the harmony (the chords before breaking up) on the lower keyboard. Here is the music for the performance (now ships with the Canon Project). At this speed - you get through the eight Canon chords very quickly - the lack of harmonic development becomes an obvious shortcoming. One of the solutions suggested in the Musicarta Canon Project is adding a contrasting section to create a 32-bar AABA version, as you hear in CD 12-05-12. Here is the whole chord sequence - just the bare chords. You need to be able to play these chords at this speed before tackling the syncopation. The first strain is repeated, making a four-strain A1,A1,B,A2 form. These are the ‘harmony chords’ shown on the upper keyboard in the second video, above. Various 'B sections’ have been offered in the Canon Project and Diary entries. As the talk-through in the second part of the first video explains, the B section here simply drops from the A chord at the end of the second strain into the key of F to play chords I-V-vi-III-IV-I of the Canon chord sequence, then modulates back into D via chords Gm and A - ii and III of F and iv and V of D.
Here is a video to help you practice the B strain chords in F.
Canon Diaries 12-05-12 features a heavily syncopated 'bouncing' (bouncing between octaves) bass line. You will decide yourself to what extent you want to develop the bass line (left hand). From the second strain on, it bounces between octaves and gets more caught up in the syncopation. Written music of the actual notes is probably not helpful. In the long run, you will probably gain more by looking-and-listening to the MidiPiano Piano Roll view of the second CD 12-05-12 eight-chord strain than from any ‘actual performance’ music. Here is a screen shot of the second strain, with the repeated audio right below. Listen until you see how the green lines in the screen shot represent the bass line. 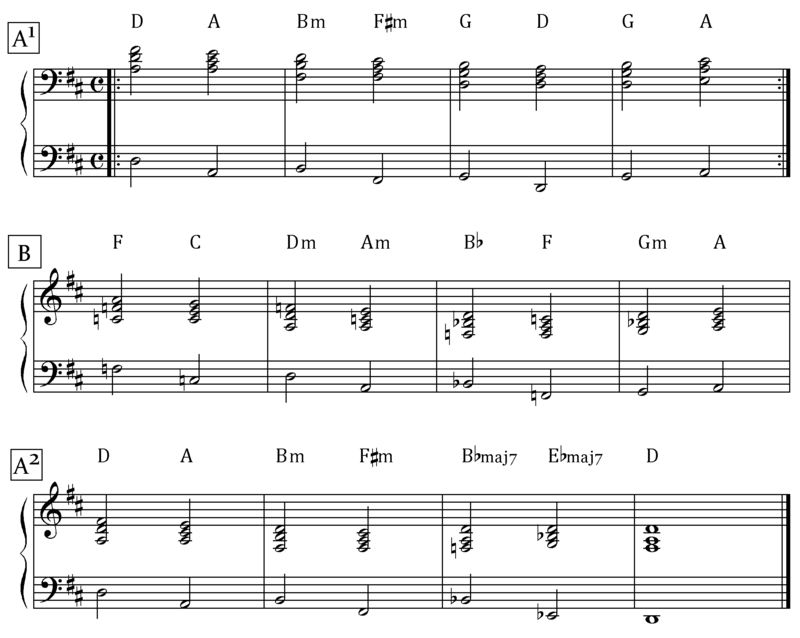 Here is a methodical bottom–top–top–bottom bass line exercise. Don’t be dragged into actually reading the leger lines! The bass notes are all roots (the notes named in the chord symbols) – the chord symbol would tell you (with e.g. a slash chord symbol) if it were any other note. Now play the BTTB bass line under the broken-up right hand. Here’s a syncopated bass line, on the beat on count 1 only. The numbers below the music are the quaver counts the left hand notes come on. If you combine the two patterns (BTTB + syncopation), you get this. The bass guitar player in Latin music sometimes anticipates every beat like this. The bass is only on the beat on the first beat of the first bar of the whole phrase. All of these effects, taken on their own and to extremes, become tiresome. These are exercises to practice so that you can anticipate beats and bounce between octaves (etc.) when you think it will sound good. As pointed out in the talk-through (second part of the first video), the ending harmonises the final tonic (note D) home in three successive chords – B flat major seven, E flat major seven and the final D chord ( flat VI maj7–flat II maj7–I ) – quite a compelling device. This is the classic ‘circle of fifths’ construction, ii–V–I. The final chord change is V–I, dominant to tonic – the ‘perfect cadence’. The chord before that is ii7, which is the dominant of V – the ‘secondary dominant’. Transposing is, in a sense, THE musical skill. Being able to play a song or piece or chord sequence in another key 'just like that' testifies to real understanding of harmony, which in turn becomes a major creative asset. Plain repetition is a perfectly respectable way to acquire this skill, and the B strain of the 12-05-12 Canon Diary offers a good working vehicle for practicing it. ...where the final III chord becomes the V (dominant) chord of the next key. The CD 12-05-12 B strain is in F. The III chord of F is A major, and that returns us to home key D. The I-ii-III (=V) device therefore lowers the home key by (modulates down by) a minor third (F to D). There are four minor thirds intervals inan octave, so if we play this modulating sequence in D, we will drop successive minor thirds through B, A flat and F majors before returning to D.
Here are the chords for this exercise. 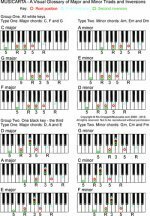 The first chord in each line of music is the tonic – you are playing in the key of that chord; that is the key signature you see. Here is a MidiPiano performance video of the exercise. The last phrase (back in D) is the regular Canon chord sequence with the flat VI maj7–flat II maj7–I ending just added on. You could instead play the A2 (final) strain of the original version to finish, or the alternative Em7–A7,11 ending. Try both, for comparison. Changing key in the course of a piece is called modulating. The overlap shows the modulating chords (E minor and F sharp) written in both keys – ii and III in D, and iv and V in new key B major. The overlapping chords are also called ‘common chords’ or ‘pivot chords’. Pop songs often modulate – both for dramatic, musical effect and to sweeten repetition for the listener. Sometimes only a section is in the new key and the song modulates back, and sometimes the song or piece ends in the new key.